The Daily Fail a huge success and musical number two on the way! After a sell-out run at the International Youth Arts Festival and a very popular run in central London’s off West End, the four creators of The Daily Fail: the musical are harvesting the rewards of their hard work. 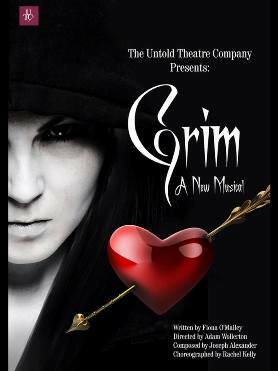 Writer Fiona O’Malley, composer Joseph Alexander, director Adam Wollerton and choreographer Rachel Kelly are now focusing on The Untold Theatre Company’s next musical production – Grim: a New Musical. This positive feedback also triggered a desire to embark on creating something new again. UTC are pleased to be able to confirm that the four creators of The Daily Fail are coming together again to create their next production – Grim: a New Musical. Grim: a New Musical couldn’t be more different to The Daily Fail. The latter is a satirical comedy. Grim is a beautiful tragedy. It’s a very dark love story about the collision of the two most powerful forces in the world: the power of death vs. the power of love. It’s about the Grim Reaper falling in love with Cupid – the angel of death falling for the angel of love – but she cannot be with him as it will ultimately be his demise. Auditions will be held for Grim: a New Musical in London after Christmas and the creative team who also make up the casting panel, are looking for triple threats: people who can sing, act and dance to a world-class level. There will be a miniature performance of Grim: a New Musical in May where a compact version of the musical will be staged. After this, UTC will workshop it before bringing it into central London with plans to hit the off West End in 2014 and hopefully after that, bring it onto bigger venues in The West End. Studied four languages in NUIG and furthered her education to a Masters level at Kingston University in Journalism. She has worked for VOGUE Magazine, The Sunday Times, The Observer and The Irish Times. Recent credits include managing her own columns in reputable papers & magazines and she devotes her spare time to writing theatre, films and novels. She is currently writing the second instalment of the ‘What Would Kate Do?’ romantic comedy trilogy novels. Composes for advertising, television, film and theatre. Alexander began his career in music as a touring musician in 2005, achieving success in the UK, Europe and USA. Collaboration and experimenting with groups, bands and artists, meant he was exposed to various genres/styles as well as composition techniques that came with it. He recently had his first choral work premiere in Hampton, London and has also been commissioned by The U3A Orchestra to compose a piece for Spring 2014. Originally from Glasgow, Rachel trained at the Italia Conti Academy of Theatre Arts. Performing credits include – As You Like It, It’s A Wonderful Life, Firing Life (workshop) and various concerts across London. The Daily Fail marked Rachel’s choreographic debut.